Your house will smell amazing after baking these in your oven! The first time I made these, our friends and fellow actors Jill and Larry were coming over to watch the Golden Globe Awards with us. The whole house was permeated with apple cinnamon smells while the apple chips cooked in the oven. While they were cooling I thought I’d better try just one to make sure they were as good as they smelled, and the next thing I knew I had eaten all of them. So when Jill and Larry arrived for the before Awards snacks, we had nothing. Okay, I opened a bottle of champagne and served it with the lingering aroma of apples and some goat cheese. 2 Gala, Idared or Empire apples – no substitutions! Other apples may have too much water content and the apple won’t really ever get crisp! Set oven racks to the bottom third and the top third of the oven. Preheat to 200°F (100°C). Line two 9×13 inch rimmed baking sheet with parchment paper. Thinly slice apples crosswise with a mandolin or sharp knife. You want the slices to look like a potato chip slice. Arrange apple slices in a single layer on the parchment paper. You should be able to get 1 sliced apple per sheet. In small bowl, combine sugar and cinnamon. Sprinkle evenly over apple slices; I use my fingers, pinching bits and sprinkling. Great job for a child between the ages of 3-6. Place one rack on the bottom rack and the other one on the top. Bake about 1 hour. Switch racks and bake for 1 more hour. Remove from oven and let cool the baking sheet cool completely on a wire rack. Gently peel off the apple chips from the paper and store then in an air tight container for 3 days if they last that long. Honestly I ate the whole thing in about 20 minutes. 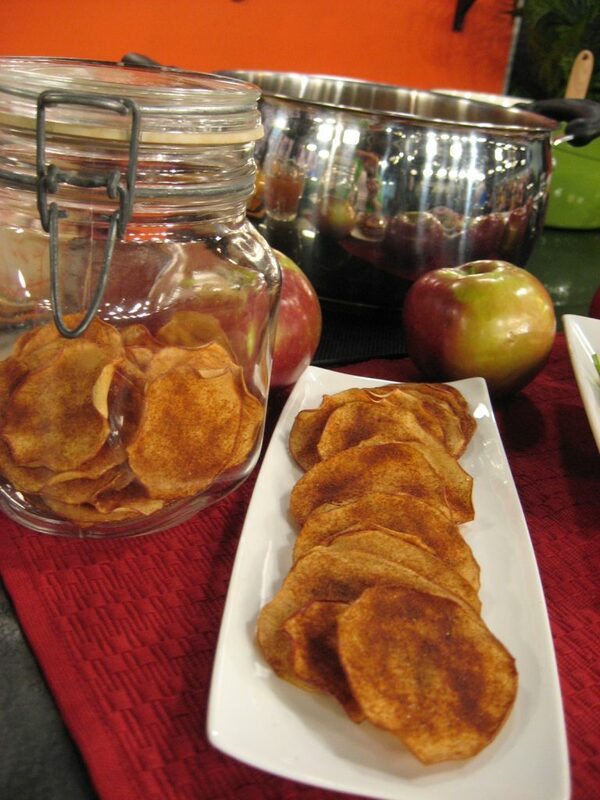 Saw the apple Chip recipe on CityLine this morning and decided it might be a good way to get the kids to eat apples. It was so delicious I don’t know if there will be any left when they get home from school! Thanks so much, this recipe will be staple at my house from now on! So glad you loved the recipe! Here’s what I wrote in Healthy Starts Here! Ok, I’ve made all these recipes with my 2 year old. He has inhaled EVERYTHING (including the soup, which is beyond amazing because he detests soup). The french toast sandwich, though, is by far my favourite. Thanks so much! Here is a hint/ little tip when you are on television (ie city line) preparing recipes….. HOLY MOLY SLOW DOWN… if I didnt’ have a pvr it would be next to impossible to follow what you are doing and using. You made a hot drink on Wed Dec 7th on city line and I backed it up 5 times to see what you used and I still couldn’t get it… Kinda feel like my time was wasted. Other than that… I love your recipes Thank you! I know I do talk fast! Thanks for the note! Click on this link for all of the recipes I demmed on CityLine on Wednesday, December 7. Well that made me smile! Love your recipes, your enthusiasm and your smile. Thanks for making me feel like cooking again!